Challenge: Install 123,832 square feet of tile in a high-profile BMW dealership. The installation must not only look beautiful, but also hold up to the demands of a busy auto dealership. Moreover, because the dealership employs dozens of technicians, renovations must be done quickly – so the repair team can get back to work. Solution: The TEC® total system met all of the demands of this unique tile installation, which includes a one-of-a-kind iCar building featuring imported tile. Strength: TEC® HydraFlex™, TEC® Ultimate Large Tile Mortar and TEC® Power Grout® were all used at the BMW dealership. These products passed rigorous ASTM C627 Robinson floor testing, which enable them to be specified for heavy commercial environments like an auto dealership. During testing, the tile assembly withstood 450 rotations of three steel wheels bearing a load of 250 pounds each, without any damage. With those test results, installers knew the other selected TEC® products rated for heavy commercial tile installation use would withstand the rigors of a car dealership. Beauty: TEC® Power Grout® delivers aesthetic benefits to the dealership. 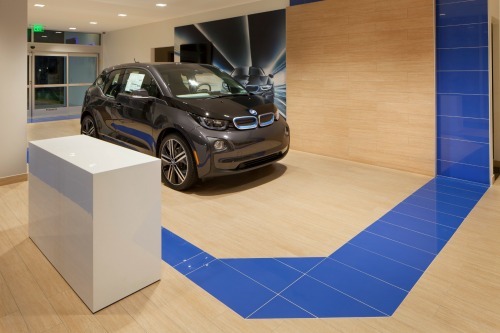 In the showroom, porcelain tile provides an elegant platform for the latest BMW models for sale. Gray tile in a running brick pattern is accented by TEC® Power Grout in Charcoal Gray. The color consistent joints and understated tile allow customers the cars to shine on a refined and elegant stage. 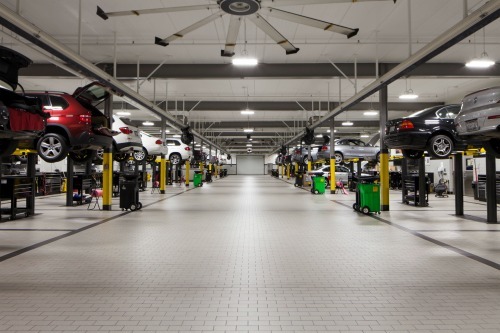 Efficiency: The installation team relied on TEC® tile surface preparation products to get the dealership up and running as quickly as possible. Their first task was correcting imperfections in the substrate, using TEC® Fast-Set Deep Patch. TEC® Fast-Set Deep Patch accepts tile in just 1 to 1-1/2 hours, allowing for efficient installation. Then, they applied TEC® HydraFlex™, which is ready for tile installation in just two to three hours. These fast-curing surface preparation products kept the installation on track.